Canterbury Cathedral is this week bringing together experts and delegates, some travelling from as far afield as America and South Africa, for a two-day conference (16 and 17 November 2017) on the historic figure known as the Black Prince. 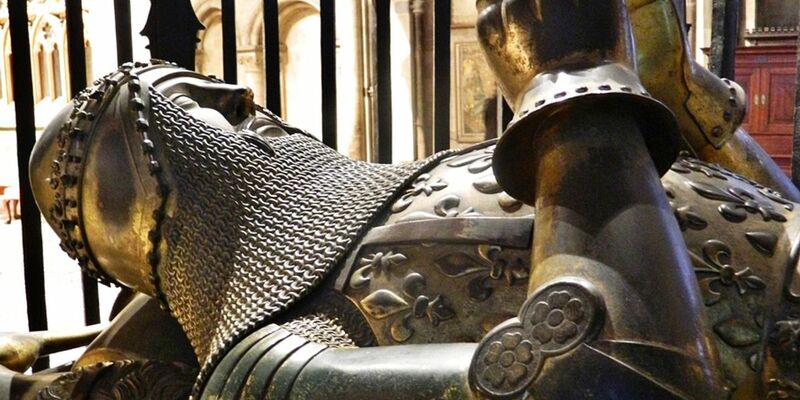 Historians and academics will be sharing their work on the 14th century Edward Prince of Wales, including why he decided to be buried in the Cathedral, the meaning of the epitaph around his tomb and why his image has captivated audiences over the centuries. The Man, Mortality & Myth conference at the Cathedral Lodge hotel, is due to be attended by nearly 100 delegates on each of the two days, and is being organised as part of The Canterbury Journey which is currently transforming the Cathedral, its Precincts and the way in which people can access and enjoy the building, its rich history and treasures. The £24.7 million development is funded by the Heritage Lottery Fund and the generosity of trusts and individuals in the UK and USA. It includes the very visible work being carried out on the Nave roof as well as this first Collections and Conservation Conference which will also look at ways of conserving and protecting the objects associated with the Black Prince, such as a helmet, shield and gauntlets. In addition, on Wednesday (15 November) the Cathedral held a free event for young people looking at the life and influence of the Black Prince through a series of workshops led by Cathedral staff and volunteers and those on creative writing and drama organised by The Marlowe. Black Prince events will conclude on Friday with a dinner and talk by Supreme Court Justice and historian Jonathan Sumption whose notable publications include a series on The Hundred Years’ War.